This sleek and elegant pool by Beau Corp Aquatics & Construction is the perfect addition to the clients’ home. Fully tiled with stunning Sukabumi stone, the pool shines in hues of emerald and jade green as the sun moves across the sky. 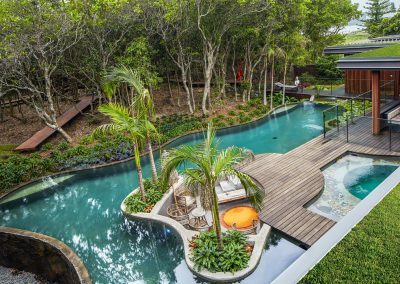 Cleverly positioned at the far-right corner of the block, the 8m x 4m pool is surrounded by a lush lawn and an exquisite granite pathway. Utilising every inch of the available space was a top priority for the clients, and the company delivered an outstanding result. The bespoke cabana and the pool area are enclosed by a frameless glass fence that provides uninterrupted garden views. Echoing the colour scheme of the dwelling, the white cabana, the bright hue of the water, and the pale granite paving combine to create an understated and sophisticated aesthetic. The landscaping was also expertly completed by Beau Corp Aquatics & Construction, and the light-coloured granite paving and coping contrast brilliantly with the conifers planted around the perimeter, which conceal the border fence beyond. Featuring a submerged bench, the pool is the perfect place to relax with family and friends. Thanks to the non-slip and highly durable tiling, the pool’s maintenance costs are greatly reduced. An E25 Salt Chlorinator and a Viron Active Glass Media filtration system from AstralPool lower running costs, which means the clients can spend less time attending to the pool and more time enjoying it. The recycled glass crystals favoured by the Viron Active Glass Media system reduce risk of bacteria build-up moreso than when sand is used. The pool area also includes submerged LED lighting and strategically placed lights among the landscaping, allowing the pool to be enjoyed at any time. At Beau Corp Aquatics & Construction, strong emphasis is placed on creating beautiful aquatic environments. Specialising in the design and construction of upscale pools, the company can add all the finishing touches to a new pool area with the same care and dedication applied to each and every element. Servicing the Brisbane and Byron Bay areas, Beau Corp Aquatics & Construction has been in operation for more than 50 years and builds up 30 pools per year. Over this time, the company has won numerous accolades from the Master Builders Association (MBA).